This is a tea caddy featuring a sloping shoulder attached with two small ears on the right and left. Its mouth, which is comparatively large, is thin, and the base has string cut marks. Its grayish black clay body was covered from the mouth to the base with a brown glaze, after which a black glaze was applied. 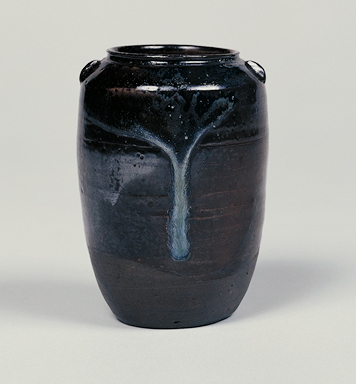 A strand of namako (sea cucumber) blue glaze runs down in the front, adding a wonderful "landscape" to the piece. The tea caddy, made under the direction of Kobori Enshū, is very elegant and has been named "Yokodake" after a famous mountain in Kyūshū.